Champion Songbird and her first foal, an Arrogate filly, at Timber Town Stable in Lexington, Ky.
Songbird, a two-time champion, became a new mother on Jan. 28 when she had an Arrogate filly at Timber Town Stables in Lexington, Ky. The 6-year-old Medaglia d'Oro mare delivered for owner Mandy Pope, who bought Songbird on behalf of her Whisper Hill Farm at the 2017 Fasig-Tipton Kentucky Fall Selected Mixed Sale for $9.5 million, the second-highest price ever commanded at North American auction for a broodmare prospect. “Songbird is a fantastic mother and both she and her foal are doing well,” a statement read from the Timber Town Twitter account. Songbird won 13 of 15 starts for earnings of $4,692,000. She was named champion 2-year-old filly of 2015, followed up as champion 3-year-old filly of 2016, and started her on-track career with an 11-race winning streak. Her resume is highlighted by wins in the Breeders' Cup Juvenile Fillies and the Grade 1 Del Mar Debutante Stakes, Chandelier Stakes, Santa Anita Oaks, Coaching Club American Oaks, Alabama Stakes, Cotilion Stakes, Ogden Phipps Stakes, and Delaware Handicap. 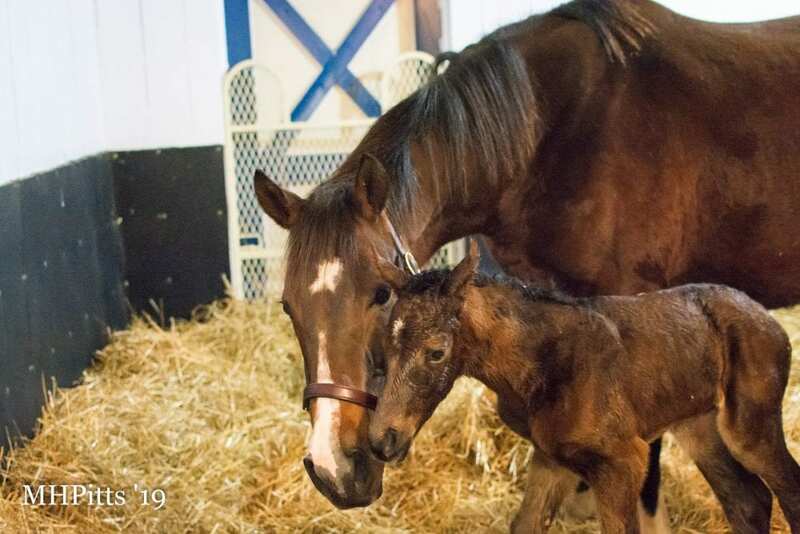 The newborn filly is part of the first crop for champion Arrogate, who stands at Juddmonte Farms in Lexington, Ky.
Arrogate, a 6-year-old Unbridled's Song horse, is North America's all-time leading money-earner, winning seven of 11 starts for $17,422,600. The victories on his mantle include the G1 Breeders' Cup Classic, Dubai World Cup, Pegasus World Cup Invitational Stakes, and Travers Stakes. Arrogate will stand the 2019 breeding season for an advertised fee of $75,000. This entry was posted in Bloodstock, NL Article and tagged arrogate, Mandy Pope, songbird, timber town stables, Whisper Hill Farm by Paulick Report Staff. Bookmark the permalink.